Pope Francis waves as he arrives for his weekly general audience in St. Peter's Square in the Vatican City yesterday. SPECIAL GARDA OPERATIONS targeting gangs and violent criminals in some parts of the capital have had their overtime stopped in a bid to save money for the papal visit later this summer, TheJournal.ie has learned. In the last 48 hours, Garda units based in west Dublin have been told that local crime operations cannot be done while on overtime. Gardaí must now carry out these activities as part of their normal tours of duty. These activities include surveillance operations targeting criminals, as well as community outreach programmes designed to reduce anti-social behaviour in certain areas. Many of these operations take place during overtime hours as it is often the case that gardaí do not have enough time to carry out all of their core duties, as well as other specialised tasks, in their normal working day. Well-placed sources said that the growing bill for the papal visit is one of the main reasons the overtime budget has been drastically curtailed. So far this year, the garda budget has gone over its estimates by €12 million. Senior gardaí have been ordered to brief their members about the changes and to reject all requests for overtime until they are informed otherwise. There is a separate budget for Operation Hybrid – a specialised garda task force targeting the workings of the Kinahan crime gang. These patrols will continue but, according to a circular sent to senior gardaí, “it is essential that this budget is not exceeded in any way”. There will still be provisions for overtime under Operation Thor which targets burglary gangs operating nationwide. Sources have explained that certain special operations were the only thing keeping a lid on the activities of violent groups in the west Dublin area. Prior to their introduction, serious public order incidents were the norm and gardaí were routinely injured in rammings and assaults. It is feared that the same communities will now left exposed to criminal gangs again. The Phoenix Park is based in the Dublin Metropolitan Region West. 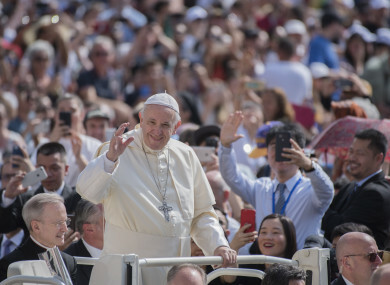 It is hoped that any savings made in the garda region in the coming months will offset the high cost of protecting the pope and spectators at the event. Pope Francis is expected to arrive into Ireland on August 24. He is scheduled to say Mass at the Phoenix Park a day later. He is attending the World Meeting of Families which is being held in Dublin between 21 and 25 August. The pontiff is also expected to visit Knock in Co Mayo. Hundreds of uniformed members will be deployed around the Phoenix Park – many to assist public order units ,with others helping stewards to keep the event safe and to avoid any crushes or bottlenecks. However, there will also be a large number of specialist units around the park on the day. These will include armed gardaí, bomb sniffer dogs as well as snipers. Members of the Emergency Response Unit will also carry out their own security detail for the Pope while he is in Ireland. Members of the Defence Forces will also be carrying out security details. An Garda Síochána is once again dealing with a serious cash flow problem and units across the country and local garda management have been ordered to cut back on non-essential policing operations in the coming months. We reported earlier this month that overtime is to be capped across the country. A new directive released to gardaí stated that overtime is to be strictly restricted to budget in a bid to stem costs. The first five months of 2018 saw such work run over-budget in the force by nearly €12 million. “Each district, division, and region must take measures to ensure that no overtime is approved which will exceed the relevant budgetary allocation in that roster,” a memo from the Garda executive states. Gardaí refused to be drawn on claims the restrictions were being imposed to free up money to police events later in the year. However, a spokesman said gardaí are satisfied with current resourcing levels. A statement read: “Local Garda Management closely monitors the allocation of Garda personnel in the context of crime trends, policing needs and other operational strategies in place on a District, Divisional and Regional level, to ensure optimum use is made of Garda resources, and the best possible Garda service is provided to the public. Email “Garda crime operations scaled back in west Dublin in bid to save funds for Pope visit”. Feedback on “Garda crime operations scaled back in west Dublin in bid to save funds for Pope visit”.